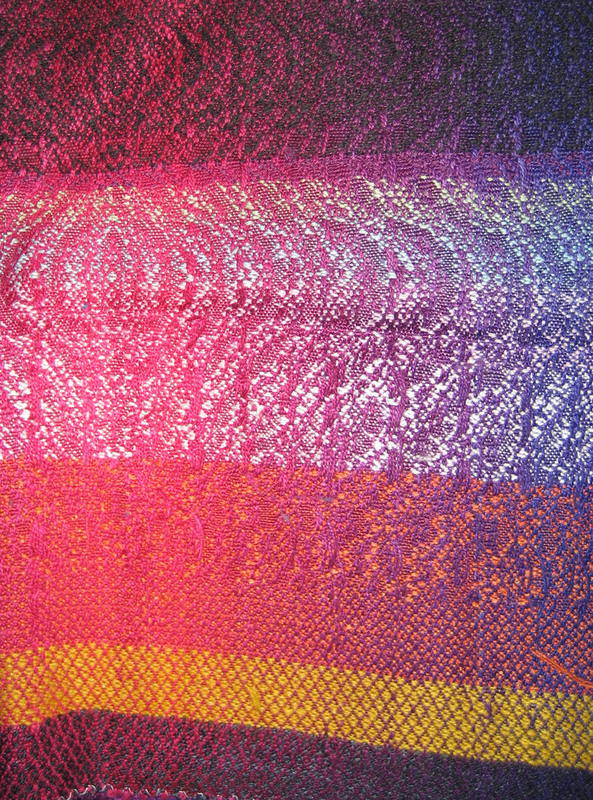 I’ve already woven up the black cashmere weft and the complex weaves.Â I am considering doing an entire shawl in pure orange weft (I think it would look very pretty), but then I’d also like to do one or two shawls using the knitted blanks that Nancy Roberts was kind enough to knit up for me.Â Which, in this case, means more color striping, probably pearl colors and possibly a red-to-gold slow color transition. I’m torn between exploring new ideas and falling back to something that I know will be lovely (I really want to weave up a pure orange weft shawl because I think it will be stunning).Â I have enough warp left to do two shawls plus a little bit of sampling, and have plenty of knitted blank to sample with.Â And, of course, I could always dye more yarn and do another warp, so it’s not as if this is the end of the story.Â I just wish I’d put on more warp! though 13 yards seemed like quite a bit at the time. It is always difficult to figure out which of many sparkling ideas to weave up.Â It ties into one of my thoughts, which is that creation is essentially a destructive process: you start with a blank slate, then carve away all the things it could have been, one by one, until all that remains is what it is.Â To accomplish anything, you must choose to give up possibility, to give up all the things that it might have been.Â That sounds simple, but I’ve known people who get so attached to possibility (or who worry so much about making the wrong decision) that they never get around to realizing anything. At any rate, I must now choose an idea and give up the other options, and faced with this dreadful choice I’m going to do the only thing left, the obvious thing: put off the decision and sample some more!Â This time I am going to focus on the pale blue/green/white weft (and maybe add in some pale purple and othersuch) and also try an orange-red variegation.Â I think this warp does best when the weft colors are very similar in value, so I’m going to focus on that for now. Off to work!Â Tonight I will start dyeing samples. Your weaving is inspirational as always Tien. And as one of the lucky recipients of your chocolates (via my Weavolution contribution), I want to say thank you for the tasty treats. I wanted to donate anyway, but getting the chocolates was great.